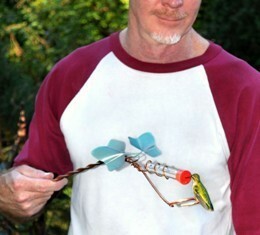 Experience the excitement of having a hummingbird sit and feed on your wand while holding it in your hand. The test tube mimics the deep flowers hummingbirds feed on in nature. What joy! Great gift idea, kids love it. Proudly made in the USA. Be sure to order extra tubes and a brush for easier cleaning.